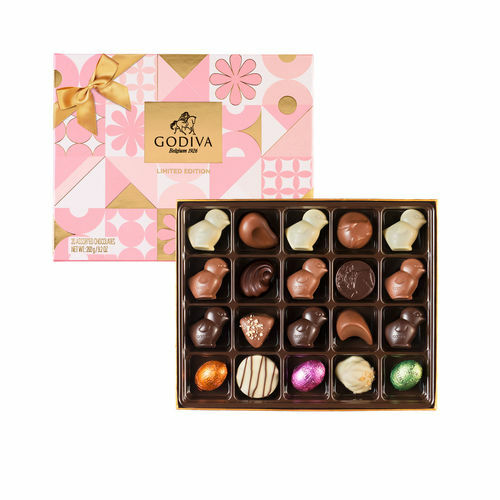 Filled with spring chocolates and Godiva classics these limited edition chocolate boxes are the perfect treat for any chocolate lover this spring. Beautiful inside and out these boxes are filled with the perfect variety of milk, dark and white chocolates and the new limited edition spring flavours. A celebration of Spring for the discerning chocolate lover, Godiva's gold box with a beautifully stylish sleeve holds fourteen of our iconic pieces. 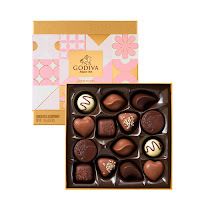 The ever popular Coeur Lait, Mielodie, Eclat Feuilletine, Lady Noir, Lune Passion, Mokalata and, Moelleux Caramel Chocolat will delight family and friends and provide memorable treats and joyful moments of indulgence. It contains 20 indulgent chocolates including milk, dark and white chocolate poussin chicks, a variety of chocolate pops, as well as a selection of our much loved signature pieces. All created from the finest ingredients, they are the perfect treat for you, your family and friends.